Rosh Hashana celebrates the Jewish New Year for Jewish Americans. 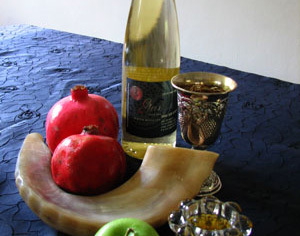 Rosh Hashana begins on the first day of the seventh month of Tishrei in the Jewish calendar. The Day of Remembrance or the Day of Blowing the Shofar are other names for this holiday. Rosh Hashana is a family time of time together with special meals and sweet foods such as challah bread and apples in honey. Before the holiday, all debts are settled and the Jewish people seek forcalendaress from others. It is a time when God looks upon a person's deeds, a time of judgement and remembrance , and a time of prayer and penitence. Prayers are often done near naturally flowing water called the tashlikh. Many take the day off based on the belief of no work permitted on Rosh Hashana. Rosh Hashana covers two days (first day is called Tishrei) which is part of the 10 High Holy Days which concludes with Yom Kippur. Festivities mark the beginning of the fall harvest since the earliest days of the Israelites. It is also believed to mark the creation of Adam and Eve- the first man and woman created by God.